Keep It Simple, Stupid. This is something I tell myself all the time. The acronym K.I.S.S. is a reminder to never do something unnecessarily complicated when a simple solution will work equally well, or even better. The training of a plastic surgeon includes in depth instruction in a wide variety of different grafts and flaps for reconstruction of defects produced by trauma, cancer treatment, and other 'misadventures' of life. Some of these are elegant and complex, and can salvage some very difficult reconstructive challenges. 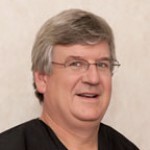 I once saw a patient who had undergone removal of a skin cancer on his cheek by a non-plastic surgeon. 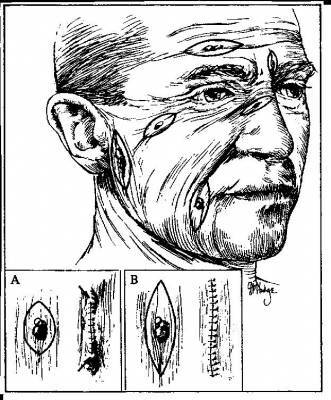 The scar gave clear testimony that the skin defect was reconstructed using a Lindberg Flap, named after the Russian surgeon who pioneered it. 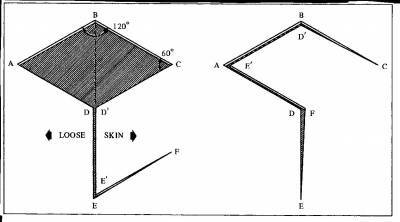 A Lindberg flap uses skin and fat adjacent to the defect and has a trapezoidal shape. I have used them and, for certain defects, they work great. When former president Ronald Reagan had a skin cancer removed from his nose a Lindberg Flap was used to close the defect. In this particular patient, the surgeon did an excellent job and the scar testified to a technically well done flap. It was, however, totally unnecessary. The skin cancer was small and the defect left after its excision could have been easily and simply closed with a few stitches. Why, then, was a complicated flap used? The cynical side of me knows that a Lindberg Flap, as a more complex procedure, is reimbursed at a much higher allowable rate by insurance companies than a simple closure. The more charitable side of me would say that the surgeon was truly trying to do a good job by using a plastic surgical technique to close the defect, and this is what I would like to think really happened. In this case, though, a simple closure would have produced an equally good cosmetic result and with much less surgery. It is a common misconception that plastic surgery is all about doing fancy, complicated procedures to produce beautiful results. The truth of the matter is that real plastic surgeons are the first to say that simple is best when it will work and produce a good result. We are trained to select out of our extensive armamentarium that procedure that best combines simplicity with a great result. As a plastic surgeon, I am often called to suture complex lacerations in the emergency room. When these are on the face, extra effort to close the wound with numerous, fine sutures is warranted because the cosmetic end result is so important and infections in facial lacerations are uncommon. On the extremities, however, the cosmetic result takes a back seat to getting the wound healed without infection. There, creating a fine, watertight wound closure is probably the worst thing to do because infections are so much more common. Placing a few sutures widely apart allows good wound drainage that minimizes the risk of infection and, ultimately, the scars are usually turn out pretty good. I have seen many instances where I had to take out all the sutures from an infected wound on an arm, leg, or hand that was initially sutured with a beautiful, and totally unnecessary "plastic" closure" by an inexperienced doctor, physician's assistant, or nurse practitioner in the emergency room under the mistaken impression that this would yield a better scar. I remember one patient who almost lost his leg and, even, his life, because a non-plastic surgeon unadvisedly used a "plastic" closure on a contaminated laceration on his knee, creating a perfect scenario for a fulminant infection with flesh-eating bacteria. By the time I saw him, a nice scar was the least of my concerns. It was only by removing all the sutures, aggressively debriding dead tissues, and transferring him into a hospital with a hyperbaric chamber for concentrated oxygen therapy that a potential amputation, or death, were averted. As important as the ability to do complex repairs may be, it must be tempered with surgical judgment to know when these are appropriate and when they are not. Complicated skin grafts and flaps are challenging and fun to do. Our prime directive, however, has to be not what pays the most or best utilizes our technical skills, but what is best for the patient.